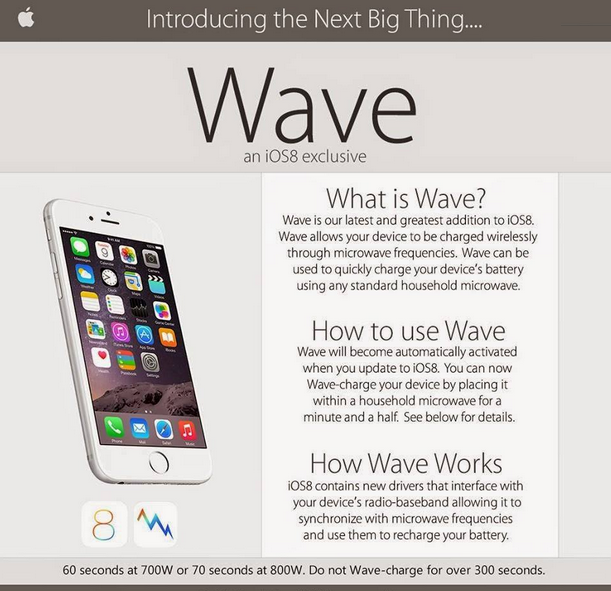 Hello Wench: Apple Wave Hoax! I never do these because I feel like they never get read, but I enjoy them! Lets talk about this wonderful hoax that has many people... well... steaming. Now usually I never really step into these things. But whoever made this, is AN ABSOLUTE GENIUS. Kudos to you for making something that looks like Apple released it themselves! But besides that point, microwaves emit a radio wave, not an electric current. So it isn't capable for currently charging any standard cell phone device. And another thing: electronic devices cannot get wet, nor can they get too hot. I've left my phone in car in the Summer heat and when I've come back to my car to retrieve it, I get the Temperature warning. So if it cannot function in the summer heat, why would it function after a minute in the microwave? Please, please, please, think about things before you recklessly run off and do them. It amazes me how many people get conned with this kind of thing! Me too! I thought I'd put some kind of PSA out before anyone else tries it and ruins their phone. I think some people just blindly believe everything they read on the internet. I mean we have more information at our fingertips than we ever have before, why would you not google this before you do it?